严文莲, 朱承瑛, 朱毓颖, 等, 2018. 江苏一次大范围的爆发性强浓雾过程研究[J]. 气象, 44(7): 892-901. DOI: 10.7519/j.issn.1000-0526.2018.07.004. YAN Wenlian, ZHU Chengying, ZHU Yuying, et al, 2018. 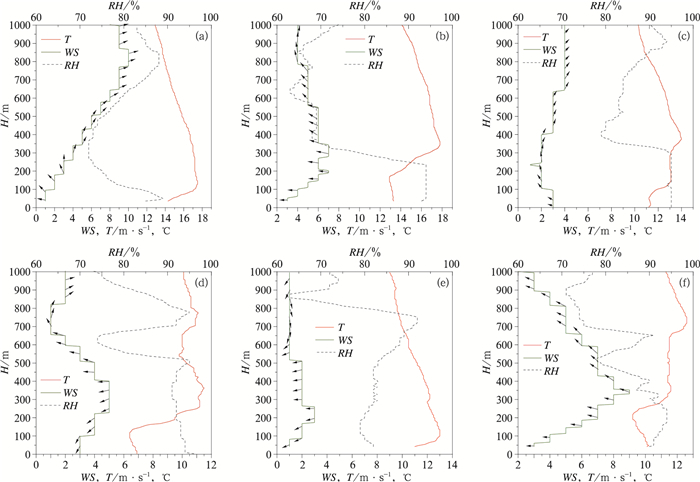 Study on a Wide Range of Explosive Heavy Fog in Jiangsu[J]. Meteorological Monthly, 44(7): 892-901. DOI: 10.7519/j.issn.1000-0526.2018.07.004. Abstract: Based on meteorological data from 70 automatic weather stations and 365 traffic meteo-rological observation stations of Jiangsu Province, a heavy fog process that occurred in Jiangsu in 11-12 February 2016 is investigated. The results show this fog process features that the fog formed and intensified explosively. At most stations, the dense fog formed rapidly with the visibility dropping directly from 1000 m above, and there was multiple burst enhancement phenomena in some areas. Along with the opened sky at night, the long-wave radiation cooling also strengthened, which was an important cause for the formation and explosive development of the wide range of heavy fog. Meanwhile, the prophase rainfall provided basic conditions for the formation of the heavy fog, and also was the direct cause of the enhanced evaporation and explosive increase of heavy fog at some sites after sunrise. In addition, strong inversion temperature provided stable atmospheric conditions for the explosive development of fog. The low-level jet near the top of inversion temperature promoted the maintenance and enhancing of the strong inversion, which played an important role in the explosive development of heavy fog. 邓雪娇, 吴兑, 唐浩华, 等, 2007. 南岭山地一次锋面浓雾过程的边界层结构分析[J]. 高原气象, 26(4): 881-889. 黄建平, 朱诗武, 朱彬, 1998. 辐射雾的大气边界层特征[J]. 南京气象学院学报, 21(2): 258-265. 焦圣明, 朱承瑛, 朱毓颖, 等, 2016. 江苏地区一次罕见持续性强浓雾过程的成因分析[J]. 气象学报, 74(2): 200-212. 李子华, 黄建平, 孙博阳, 等, 1999a. 辐射雾发展的爆发性特征[J]. 大气科学, 23(5): 623-631. 李子华, 黄建平, 周毓荃, 等, 1999b. 1996年南京连续5天浓雾的物理结构特征[J]. 气象学报, 57(5): 622-631. 刘霖蔚, 牛生杰, 刘端阳, 等, 2012. 南京冬季浓雾的演变特征及爆发性增强研究[J]. 大气科学学报, 35(1): 103-112. 陆春松, 牛生杰, 杨军, 等, 2010. 南京冬季一次雾过程宏微观结构的突变特征及成因分析[J]. 大气科学, 34(4): 681-690. 濮梅娟, 李良福, 李子华, 等, 2001. 西双版纳地区雾的物理过程研究[J]. 气象科学, 21(4): 425-432. 濮梅娟, 严文莲, 商兆堂, 等, 2008a. 南京冬季雾爆发性增强的物理特征研究[J]. 高原气象, 27(5): 1111-1118. 濮梅娟, 张国正, 严文莲, 等, 2008b. 一次罕见的平流辐射雾过程的特征[J]. 中国科学:地球科学, 38(6): 776-783. 赵德山, 洪钟祥, 1981. 典型辐射逆温生消过程中的爆发性特征[J]. 大气科学, 5(4): 407-415. 中华人民共和国国家质量监督检验检疫总局和中国国家标准管理委员会, 2012. GB/T 27964—2011: 雾的预报等级[S]. 北京: 中国标准出版社. Roach W T, Brown R, Caughey S J, et al, 1976. The physics of radiation fog: Ⅰ-a field study[J]. Quart J Roy Meteor Soc, 102(432): 313-333.